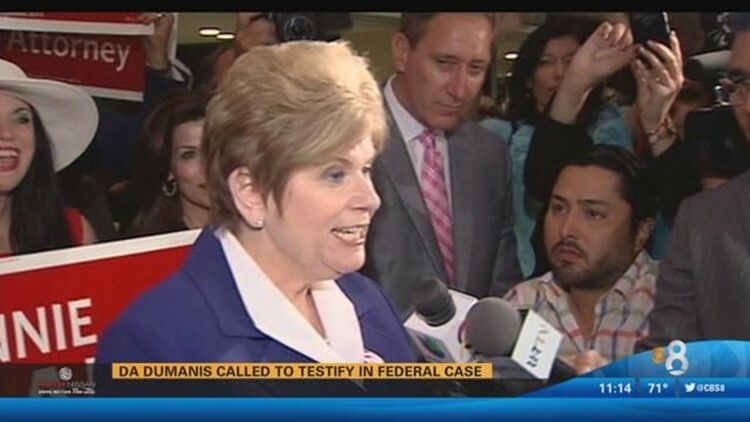 SAN DIEGO (CNS) - San Diego County District Attorney Bonnie Dumanis was reported to have been subpoenaed to testify in the ongoing trial of a Mexican businessman charged with conspiring to funnel money into her 2012 mayoral campaign and those of ex-Mayor Bob Filner and others. Jose Susumo Azano Matsura allegedly made several illegal contributions involving various campaigns for elective office in hopes of gaining the influence needed to turn San Diego's bayfront into a West Coast version of Miami. It is illegal for non-U.S. citizens to contribute to political elections. Azano now faces federal charges in connection with $600,000 in illegal contributions made using straw donors, shell companies, independent committees and campaign services. His attorney, Michael Wynne, told the San Diego Union- Tribune he planned to subpoena former Mayor Bob Filner, Rep. Juan Vargas and developer Doug Manchester, in addition to Dumanis. In June 2014, it was revealed that she wrote a letter of recommendation to the University of San Diego on behalf of Azano's son. In an interview in July 2014, Dumanis said she did not know the younger Azano and wrote the letter at the request of retired San Diego police Detective Ernie Encinas, who worked for Jose Azano. Encinas has pleaded guilty to conspiracy and tax evasion in the campaign contribution scandal. Wynne told the Union-Tribune he hoped Dumanis would counter federal prosecutors' arguments that Azano was conspiring to contribute to her mayoral bid. "The truth is Mr. Azano had nothing to do with her campaign," Wynne said.